Things move kind of fast in Stephen Strange’s world. Take your eyes off the prize for even a minute and the chances are you’ll find yourself running just to try and stand still while you unravel and attempt to make sense of all of the things that happened when you blinked or looked away for the briefest of moments. That whole chasing after the plot while shaking your head and muttering “What? How?” to yourself kicks in almost immediately in God of Magic because somewhere along the line, Stephen lost his cloak, position and house to Loki. Yeah, you’re not imagining things; you just read what you thought you did. Loki is now the Sorcerer Supreme. And Stephen? Well, he’s a veterinarian who talks to dogs. Actually it’s just one dog that he converses with, a basset called Bats, but you know, potato po-ta-toe. And you’d think he’d be mad about it (being a vet that is, not talking to dogs), raging at the Vashanti for taking away his power and giving it to, of all people, the God of Mischief. But he’s not. Stephen as it turns out is quite fine, and more than okay, with the situation. At least he is until Loki crosses a line that he can’t ignore, which is when the former Sorcerer Supreme decides that enough is enough and it’s high time that he got his old job back. And that, boys and girls, is when God of Magic slams into high gear, and the show really begins. Not that it was idling before that, as Donny Cates uses the calm before the storm to create a wonderfully detailed tale of one man who is strangely dissatisfied with his new lot while pretending to be perfectly content and another, who despite being given the keys to the kingdom, is still desperate for more as he strives to find the one thing that will give him what he has always desired, ultimate power. Oh and that feeling of being slightly confused and desperately trying to catch up with everything that nearly overwhelms you at the start of God of Magic that I mentioned earlier? Don’t worry about it, as author extraordinaire Donny Cates deals with that in exquisite fashion, filling in all of the details as the plot surges forward. In a story in which Stephen teams up with a most unexpected, but thoroughly welcome ally (as everybody needs friends. 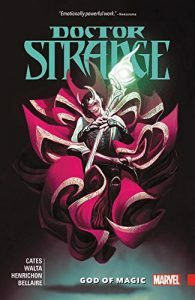 Especially when they’re about to take on a God), suffer heart-breaking loss*, storms the gates of Asgard and fights to the bitter end to reclaim what is rightfully his, Donny Cates pushes the excitement pedal through the floor and redlines the enjoyment—o-meter and shows the world why Stephen Strange is far more than a three card monte flim flam man and that there’s far more in his proverbial hat than a string of multi-coloured handkerchiefs and a couple of overweight white rabbits. *If you want to stay spoiler free, stop reading now. Mr Cates, the Bat’s thing? Dude, that wasn’t a cool thing to do as some of us “own” Bassets and Beagles. It made me reach for the tissues in double quick time as some grit managed to work its way into my tear ducts right at that moment. And while the finale went some way to redeeming the Bat’s arc, it was still a bullet to the soul. But I guess it’s my fault as much as anyone else’s and I should have known better and realised what was going to happen. Soon as you bring anthropomorphised animals into a story, it never ends well. Disney taught me that.